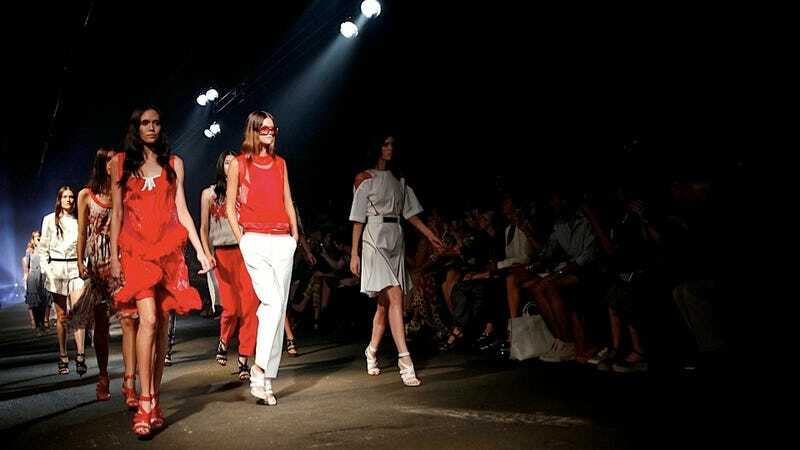 According to Vogue's Emily Holt, Prabal Gurung's 2013 spring collection has a lot to do with the looming presidential election, which translated on the runway to a looser fitting clothes that "would liberate women's movements as they go about their day." You know, like help them vote or whatever — I'm not really sure because I know almost nothing about fashion. I say "almost" instead of "absolutely" because I've seen The Devil Wears Prada like four and a half times. I have, however, seen Mortal Kombat like forty-seven times and know that, if these looks entered into a deathmatch tournament, some would fare much better than others. What follows are some...matchups. Fashion people of the internet, look on this slideshow and despair — it's the Prabal Gurung Spring Collection Smackdown. Ah, your classic Western good vs. evil color scheme. This fight comes down to matter of preference, really, so if you think the stealth look is more your speed, it probably means you're evil and would shoot John Wayne in the back, or whatever. No judgment. Shorts + sweater = jaunty, and if Spider-Man has taught us anything over the last decade, it's that jaunty wins all the time. The right-hand look's biggest flaw? Its sunglasses render its ink-blot opponent almost invisible. This is really a contest between technicolor and black and white. If you're super-pretentious and "only watch movies before 1939 because shadows and light and blah, blah," then the grey dress (?) beats its whimsically pink counterpart easily. However, if you appreciate what wonders technicolor worked for animal documentaries about flamingos...well, the answer's pretty obvious. These looks illustrate the difference between two wildly different future dystopian civilizations that, come to think of it, aren't so different after all! On the left, the tinfoil people have invented a way to reflect the sun's unmitigated rays back into space, thus making everyone far too cool for their own good. On the right, wallpaper manufacturers have formed an oligarchic power structure by making outfits that allow them to be a fly on any wall. Something about ruffles. Belts are weapons, etc.